One-step wet mopping is suitable for non-textile floors, which are only slightly dirty. This method is more economical when compared to the classic two-step wet mopping. The two-step wet mopping procedure is the classical wet mopping method and is performed using a double bucket trolley with wringer. During stripping, worn floor finishes as well as all the loose and sticking dirt are removed from the floor covering. Stripping is a multi-stage cleaning process, which is performed at larger intervals. It is advisable to coat heavily used floor coverings with a polymer dispersion. In doing so, a wear-resistant floor finish is created, which protects the floor. Depending on the requirements, various coatings can be used, which can be applied to coatable and water-resistant floor coverings, such as linoleum, PVC and sealed parquet. A single-disc machine can be used to wet scrub, polish and sand floors. The single-disc machine is used within the scope of stripping to evenly distribute the cleaning solution and to scrub off sticking dirt and loosened, worn floor finishes. Wet vacuum cleaners are suitable for removing water and loosened dirt from non-textile floors. 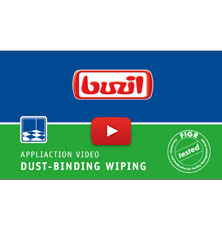 Dust-binding wiping is used to effectively remove loose dirt. Routine cleaning of sanitary areas presents a particular challenge from a hygiene perspective. They must be cleaned particularly carefully, taking various factors into account. The often high level of soiling and the wide variety of materials present a particular challenge when cleaning in industrial and workshop settings. 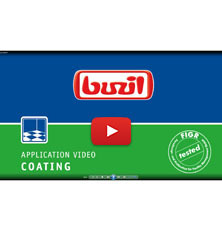 The Buzil user video explains the process for cleaning production equipment step by step and offers valuable tips on how to use cleaning solutions. Large surface areas in workshops and industrial firms often contain especially stubborn and unusual types of soiling. This user video shows the best way to remove dirt such as glue, graphite, resin, rubber residue, scuff marks and forklift truck marks and clean industrial spaces using a scrubber drier. 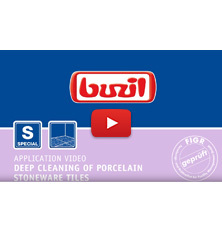 Deep cleaning of porcelain stoneware tiles removes stubbornly adhesive dirt. Acidic deep cleaners are suitable for removing mineral deposits. An alkaline deep cleaner can effectively remove organic soiling. Porcelain stoneware tiles without a ceramic coating have a microporous surface which requires special cleaning. Tiny particles of dirt and lime can easily penetrate the microporous surface, dulling the tile. To prevent this from happening, there are a few things to note during routine cleaning.